TeamA team is an entity, usually a company, which subscribes to the Workplace service. A team is made up of members and connections. members are regular, unrestricted users of Workplace"Workplace" describes the Autotask Workplace service in its entirety. (as opposed to Connections). By default, team members have a "MemberA member is any user with a Autotask Workplace account and the ability to be allocated storage within the Autotask Workplace environment." security level, which grants them access to most Workplace OnlineWorkplace Online is the web portal that users within a team can use to access their data and administer their team. features. They do not have administrative permissions by default, but may be granted such permissions by another administrator. For more information about which functions within Workplace Online are available to different security levels, refer to Security Levels. Click the member you wish to view. Refer to Team Member Details for more information. To filter by role, click the Role link and make a selection. To remove a filter, click the icon in theFilter field or next to the filter name. 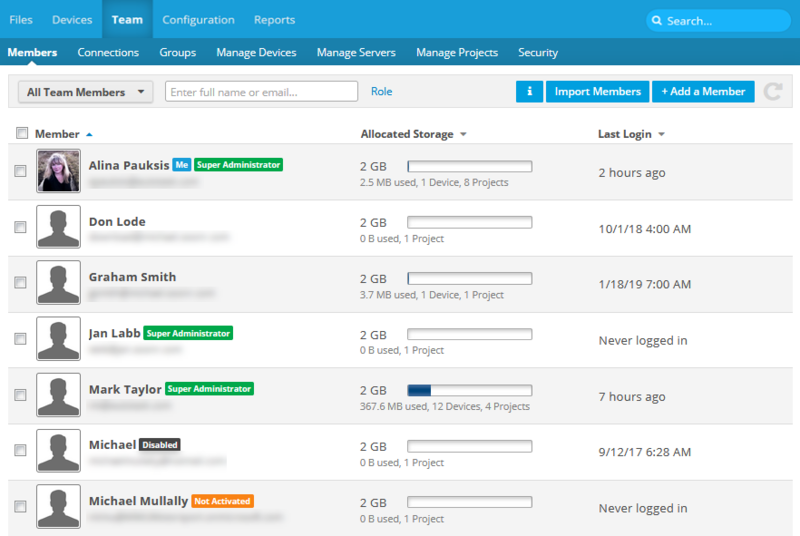 Click the Manage storage link. Enter the amount directly or use the +/- icons for each user. Select the users whose storage you wish to update, enter an amount in the storage field in the Manage Storage area, and click the Allocate to Selected Members button. For more information, refer to Manage Team Storage Quota. The import feature allows you to create several team members at once by importing their data from a .csv (comma separated values) file. Each record must be on a separate line. The first two fields, full name and email address, are required. You can also specify phone number and storage quota, in that order. A default 2 GB quota will be assigned unless otherwise specified. Depending on your language and local settings, your .csv file may use either commas or semicolon delimiters. Note that commas must be replaced with semicolons for the import to succeed. Optionally select the user whose settings you wish to copy to your imported users. Click the +Add a Member button. Complete the fields on the New Member page. For detailed information for the fields on the New Member page, refer to Add a Team Member. Use the check boxes on the left side of the member list to select more than one member. Hover over the member record and click the icon, or right-click the member record. Update member information as necessary. For detailed information for the fields on the Edit Team Member page, refer to Edit a Team Member. Before you can add a member to a group, you must first create the group. For more information, refer to Groups. Select Add to GroupA group is a collection of members and/or connections. Groups can be share recipients, thus making sharing simpler and more convenient. from the menu. Begin typing the name of the group, or click to select one from a list. Click in the blank field and select the policy profile you wish to apply. Select Email from the menu. A new message form in your default email application will open, with the member's email address already populated. Select Resend Welcome Email from the menu. Click Resend in the resulting popup to confirm. Disabling prevents the user from logging in, but the user will continue to consume a license and storage allocated to them. You can only disable a member who is currently enabled. You can only enable a member who is currently disabled. You cannot disable yourself. Select Disable or Enable from the menu. Select Delete from the menu. If the member is not a project owner and has no devices associated with them, skip to step 6. 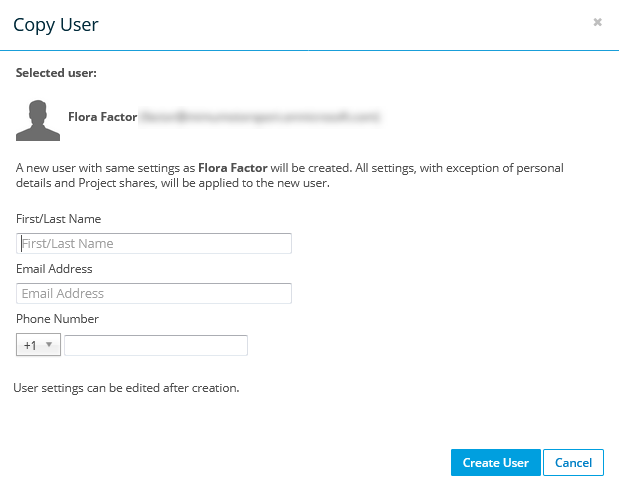 In the Not reassigned project will be: field, you can choose to assign to yourself all projects that you have not explicitly reassigned, or delete all projects that have not been reassigned. For devices, choose which action you want to take (Wipe or Don't Wipe) for each device associated with the member. This page summarizes the actions that will take place when you complete deletion, i.e. project reassignment or deletion, remote device wipe. If you have chosen to delete in the previous step, you must select the confirmation check box. Enter the full name, email address and (optionally) phone number.